Here’s an idea whose time may have finally arrived: release of an Interface Control Document (ICD) for the Galileo open service (OS) — in essence, a set of specifications to which engineers can design and manufacturers can build receivers. European sources suggest that publication of the ICD could take place around April 20 and would fill in some key missing details. 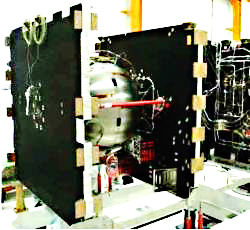 This development follows on the heels of a late-March decision by a bilateral U.S./European technical working group that the future GPS civil signal (L1C) and the Galileo OS will use an optimized version of the BOC (1,1) format tentatively accepted under the 2004 agreement on GPS/Galileo cooperation. If realized in action, this would be doubly welcome news for manufacturers, design engineers, and system developers eager to exploit the promise of expanded, modernized GNSS signals. It would also help sustain the surge of interest in Galileo that has taken place since launch of the program’s first experimental spacecraft last December. Over the last couple of years, a series of papers coauthored by members of the European Commission (EC) Galileo Signal Task Force have laid out elements of the frequency plan and signal structure: RF bands, lengths and types of codes, data rates, and so forth. What had remained missing were the Galileo codes and the navigation message structure. Some manufacturers have tried to overcome this problem by designing GNSS receivers with reconfigurable chips, using field programmable gate arrays (FPGAs) that could be updated when the final spec became available. But such work-arounds are inherently messy, complicating sales and marketing efforts and building in a need for early upgrades and extra customer support. Moreover, the absence of technical guidelines and standards inhibits engineering managers and companies in adapting new technologies, particularly those in sectors such as aviation and automotive engineering with lengthy design and certification cycles. Galileo, of course, is a work in progress, and most people in the GNSS community understand that technical details will change as the project evolves. That was the situation with the Global Positioning System, in which smudged and much-photocopied documents circulated in the engineering community and helped with the design of GPS products that appeared long before the final official ICD in the early 1990s. What made the ad hoc process work and kept this GPS “living document” alive was the willingness of the GPS Joint Program Office and its contractors to communicate openly with the manufacturing community. However, it was becoming unclear as to who was really in charge of the Galileo ICD process: the European Space Agency (ESA), the EC through its signal task force, the Galileo Joint Undertaking (GJU) negotiating the concession contract, the Galileo Supervisory Authority that will oversee the program, or even the concessionaire who would understandably want to claim every possible piece of Galileo-related intellectual property. And, finally, GARMIS, a consortium of 30 companies led by France Developpement Conseil holds a €4 million GJU contract to provide “engineering support for optimizing the Galileo documentation,” including the Galileo ICD. In addition to this divided responsibility for the ICD, a divergence was occurring, not only between European and non-European companies, but even among European companies. That created the peculiar situation of one manufacturer announcing a GPS/Galileo-capable receiver with the caveat that the Galileo functionality was available only to customers authorized by ESA. Or a well-positioned European company offering a GNSS signal generator with Galileo functionality that the vendor claimed would always be a step ahead due to the company’s involvement in writing the Galileo ICD. So, the prospect of an initial Galileo ICD appearing in the near future will dispel doubts, sustain enthusiasm for the project, and provide a crucial resource for the real work of engineering a better GNSS future.